The Rooster Run Golf Course started as pancake flat pastureland. Meandering through the property were three creeks. Along their beds grew native willows, cottonwoods and oak trees. These creeks and two ancient trees were incorporated in the design of the golf course, a total of 370,000 cubic of soil was moved to shape the course. As a result, the course features undulating hills, six lakes and the areas only island green. There are thirty-nine fairway and green-side bunkers, adding to the challenging play of the course. New Year’s Day, President’s Day, Memorial Day, 4th of July, Labor Day, Thanksgiving. Rooster Run will be closed on Christmas Day. The Pro Shop at the Rooster Run Golf Club provides players with everything they need to enjoy a successful round of golf. With both women’s and men’s apparel, the Pro Shop offers seasonal selections of outerwear for the winter months and light breathable materials for the summer months. Our clothing lines feature a variety of shirts and sweaters from Adidas, Antigua, and Footjoy. The Pro Shop is also fully stocked with a broad selection of logo products including headwear, golf balls and golfing accessories. No detail is missed. Our prestigious golf club lines, comprised of Callaway, Mizuno, Cobra and Titleist, offer players the best clubs on the market at competitive prices. Club fittings are provided upon request. 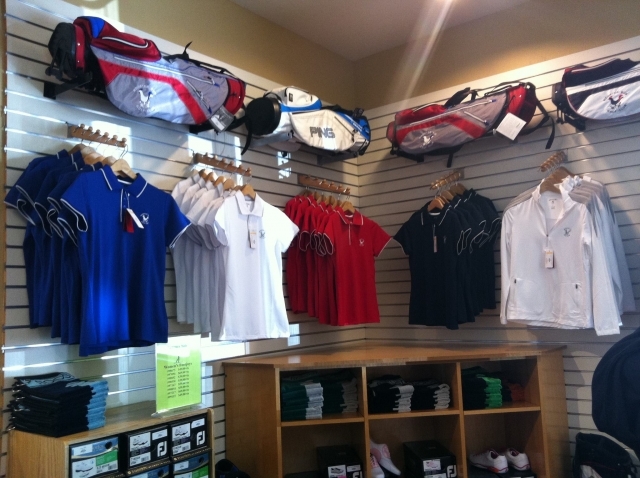 Rooster Run Golf Club’s attentive Pro Shop staff are happy to assist you with any of your pre or post-round needs. As you begin or end your golfing experience here at Rooster Run Golf Club, feel free to stop in and take a look at our great selection. The Pro Shop is open sunrise to sunset every day other than Christmas. The Rooster Run Cafe is located in the main pro-shop building and offers a variety of options to take with you while making the turn as well as a relaxed atmosphere to enjoy a post round beverage. Click the link below to view our current selections. Rooster Run Golf Club has a number of options to meet any golfer’s requirements. With an all grass teeing area on the driving range and two practice putting greens, this is truly the “one stop” practice facility for which you are looking. A medium length par four usually playing downwind with water reachable to the right off the tee. A great tee shot is a layup between 125 and 150 out leaving you a great opportunity to begin your round with a par or better. Downwind par 5 where big hitters can go for the green in two. There are penalties however, a creek and trees running in front of the green await errant tee shots. Placement of your second shot is key here. This is a medium length par four which topically plays shorter then the yardage. No real trouble off the tee, locating the correct area of the green on your approach is the key to a good score on this hole. Off the tee the fourth hole appears similar to the previous hole however fairway bunkers left and right provide a challenge. Avoiding these should lead to a great chance for par or better. The first of six consecutive holes playing into the wind. Stay below the hole with your approach on this severely sloped green, over the green here is almost a certain bogey or worse. The first par three of your round has water short and left as well as a bunker short right. Green is larger then it appears from the tee and sloped front from back to front. This is the most difficult hole on the golf course. Usually playing straight into the wind, this long dogleg left par four has a water hazard running the entire length of the hole on the left. A creek running across the fairway must be avoided off the tee as well, par here feels like a birdie. This is one par three which always plays longer then the yardage. From the back tees and the standard wind blowing, this long tee shot is a driver for most and many players may still not reach the green. 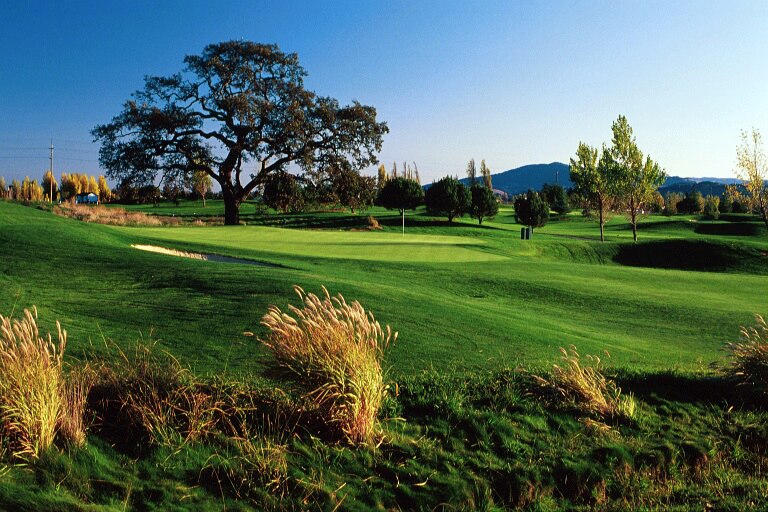 One of the most difficult par fives in Sonoma County, the water to the right is in play off the tee and the water to the left is in play on both the second and third shots. The fifth straight hole into the wind often plays like a par six. The last of six consecutive holes into the wind, this par five is a great chance for birdie. No water hazards and the absence of fairway bunkers make this one of the easiest driving holes on the course. The lake on this medium length par three is only for visual intimidation and should not come into play. This is a very large green though it appears much smaller from the tee. This short par four plays even shorter as the prevailing wind is always at your back. Wide open off the tee, the difficulty here is putting. Possibly the most severe green on the course, staying below the hole here is a must. This par four into the wind has a fairway bunker on the right and a water hazard down the left side. This hole is more difficult then it appears with the second shot always playing one to two clubs longer then the yardage. This dogleg left par four is a local favorite. The hole requires a great tee shot with a hazard down the left side and a cross wind from right to left.The lake surrounding the green on the 15 hole comes into play if you hit your drive through the fairway. One of the flatter greens on the course. The island green on this hole can be very tough with the prevailing wind into your face. A front pin location can leave a devilish putt back down the hill. OB down the left and a bunker on the right off this tee. The green is flanked by a grass bunker to the left and a small bunker on the right. Very important here to be on the correct side of the green as a large ridge splits this putting surface in half. The signature oak tree on the course sits behind this green and frames this down wind par four. A small creek runs through the fairway at about fifty yards from the green. A great opportunity to finish with a par or better on this down wind par five. This green can be reached in two by many but be careful of the tall cottonwoods which frame your opening and the water hazard twenty yards in front of the green. Play unlimited golf anytime Monday – Friday & after twilight begins Saturdays, Sundays & Holidays. Play unlimited golf anytime any day of the week including holidays. The Annual Fee Program is a 12 month agreement, memberships will begin on January 1st. 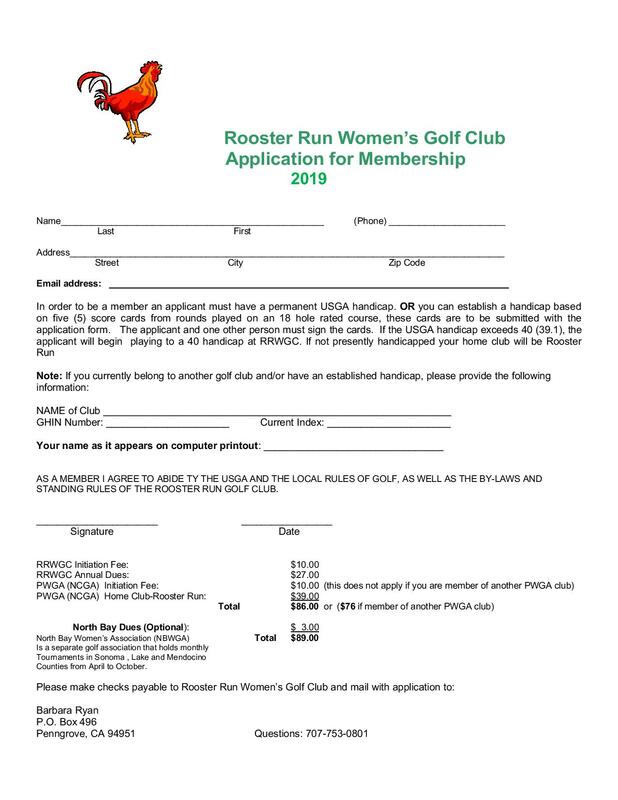 For more details call the Rooster Run Golf Shop at (707) 778-1211 or fill out form. Play Tuesday Mornings starting at 7:30am during the summer and 8:30am the rest of the year. To download a pdf application, Click Here. Play on either Saturday or Sunday once a month. First starting time is 7:30am. Click here for more information. Play on Wednesday morning, first tee time is 7:30am. Visit the Web Site for more information. Monday nights beginning in May and running through August. The fee is $32 per player per night. Please call the golf shop at (707) 778-1211 for further information.